The Posiflex KS7315 series offers a powerful, industry-leading, Intel 1.86GHz Celeron M CPU with 1MB L2 cache. The popular fan-free KS7315 family combines optimal performance, low power consumption and heat output with ease of maintenance. The green footprint allows companies or divisions to meet corporate mandates related to the development of energy saving systems and devices. 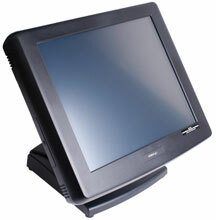 The KS7315 is available in 15" and 17" resistive or infrared touch options. Both models are configurable to wall mount solutions and are optimized for retail, quick service, full service hospitality, grocery and specialized markets.